"Healthy School Food and Hands-On Learning in the Garden"
Students grow, cook and eat fresh food from their school garden. It was so gratifying to hear in the farewell speeches of so many fifth graders that their happiest memories of school were in the garden! 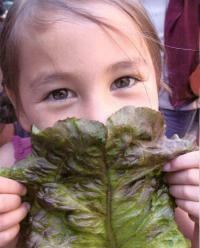 John Muir School wanted to teach kids about healthy eating while greening the school campus. In the past seven years, the school has built an amazing educational garden and has been rethinking school lunch. As each year progressed, the garden continued to expand and encroach upon the campus allowing for an exciting type of outdoor and hands-on learning to grow in the minds and hearts of the children. In 2004, John Muir became part of the School Lunch Initiative. Changes were made to promote healthier, fresher food as part of the school lunch, and to reduce the garbage and waste associated with the food service program. A comprehensive recycling system is in place that allows them to separate waste into three groupings: food waste, plastic/metal, and landfill. John Muir also is lucky to have a creek running through its property and we organize a creek clean-up. Our school is also a pick-up site for the local, organic Community Support Agriculture (CSA) Box provided by Full Belly Farm. The first years saw the completion of a multi-terraced garden built solely by the hands of kindergarten-through-fifth graders. Each classroom has time each week with either garden coordinator, Jasper Eiler, or Chef Carrie Orth, for hands-on learning about food. Every child at the school helps prepare the soil, sow seeds, tend the plants and harvest the crops. Whether this experience will influence the food choices children will make over the longer term is one of the questions the University of California’s Center for Weight and Health is examining. The fourth and fifth graders at John Muir School, along with three other schools in the Berkeley Unified School District, took a survey about food opinions and choices. The kids kept a food diary for three days, writing down everything they ate and the amounts. The children in the study will participate for two more years and the information collected will be used to evaluate the impacts of the School Lunch Initiative. Get lots of people and organizations involved! A grant from the California Nutrition Network, through the U.S. Department of Agriculture, supports the garden instructor position. Small grants from the Center for EcoLiteracy have supported the School Lunch Initiative, the development of the garden curriculum, and the construction of the garden. Michael has also raised other outside funds to pay for plants, garden materials, and tools. Students are also involved with an annual donations campaign, writing letters to local businesses to raise money for garden essentials and to raise awareness of the school’s goals for a healthy body, mind, and earth. The bell schedule has been changed so the children go to recess before lunch. Since they play first and eat second, without rushing to have enough time to play, there is less food waste. By the end of lunch nothing remains of the salad bar. The teachers now even eat lunch with their class.